The current system of international law is experiencing profound transformations. Indeed, the simultaneous processes of globalization combined with the disintegration of international systems of governance and law-making pose complex challenges for legal scholarship. The doctrinal response to these challenges has been theorized within two seemingly contradictory discourses in international law: fragmentation and constitutionalisation. 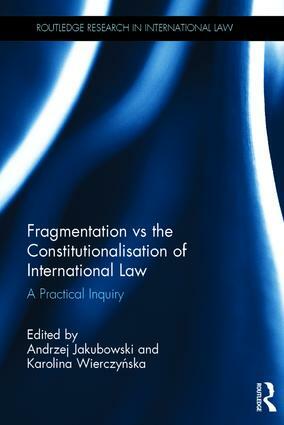 This book takes an innovative approach to international law, viewing the processes of the fragmentation and constitutionalisation as being profoundly interconnected and reflective of each other. It brings together a select group of contributors, including both established and emerging scholars and practitioners, in order to explore the ways in which the problems of fragmentation and constitutionalisation are viscerally linked one to the other and thus mutually conditioning and stimulating. The book considers the theory and practice of international law looking at the two phenomena in relation to the various fields of international law such as international criminal law, cultural heritage law and international environmental law. Andrzej Jakubowski is Assistant Professor at the Institute of Law Studies of the Polish Academy of Sciences. He has authored a monograph State Succession in Cultural Property (OUP, 2015) and edited a volume Cultural Rights as Collective Rights - An International Law Perspective (Brill, 2016). Karolina Wierczynska is Assistant Professor at the Institute of Law Studies of the Polish Academy of Sciences where she serves as a managing editor of The Polish Yearbook of International Law. Her current research relates to the admissibility issues before the ICC.